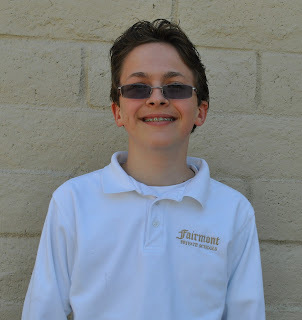 Fairmont students are usually well-rounded, intelligent, and unique and seventh grader Brandon Donovan is no exception to that rule. Those of us who know Brandon are well aware of his good sense of humor and quick wit. We also know he's smart, curious and talkative; always willing to share a story or ask about your day. But what he may not share very often is his talent for singing. Brandon is dedicated to the All American Boys Chorus, a choral ensemble that is composed of boys from around Southern California. This is Brandon's 6th year as a member of the group, a tenure that is one of the longest amongst the boys in the chorus. He sings second tenor, the highest voice in the boys' choir, although he doesn't know if he will be able to keep this seat for much longer. Brandon’s singing talents have opened up a world of new experiences. Last year, Brandon and the choir travelled to Australia, Singapore, Hong Kong, Malaysia, and Canada. This year, the choir is planning a major US tour. He has also had the opportunity to meet and sing with many talented vocalists over the years, including Josh Groban. Brandon practices with the chorus at least 6 hours a week, but sometimes as much as 9 hours a week. Practices are held both on weeknights and weekends, so there isn't much time for many other activities in Brandon's life, although he did find time to play on Edgewood’s soccer team last year. If you hear Brandon talk about his experiences, you'll know that he's extremely proud of his singing, his school, and his family. His mom, cat, and parrot are all supportive of the time and effort Brandon puts into his singing and schoolwork. He says he couldn't do it without them. They aren't the only ones proud of Brandon, so are we, his school. His teachers and his friends are proud of all of his accomplishments, both academic and vocal. Brandon is a unique and special kid, who fits in perfectly at Fairmont.